A comprehensive information source for any area of modern Christian music. 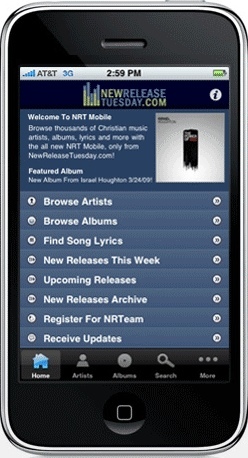 New Release Tuesday released a free iPhone application a few months ago which holds a wealth of information on Christian music. You need to be connected to the internet to use it, but if you have any questions about contemporary Christian music you’ll probably find it here. You can search through the comprehensive list of artists to read a mini-biography of their history, a discography of their albums (with pictures), links to various websites (e.g. official site, myspace and many more) and also a photo. You can search by album if you happen to know the album name but probably more useful is the genre section. This produces a list of albums in any given genre (e.g. gospel) which may throw up a few new bands for you to listen to. One of my favorite features is the lyrics section. Simply type in a phrase from a song it will come up with the song/s that have it in! Perfect for when you just can’t remember the artist or song title! Finally there is the option of seeing recent releases, or upcoming releases to make sure your finger is always on the pulse. Overall New Release Tuesday’s iPhone application is really well designed and clearly not just thrown together to get something out there. I was impressed by the volume of artists included in their database and clearly this is the strength of the application. Now no matter where you are you can find out anything about Christian music! I understand this is really boring and you really are skipping to another location comment, however i simply wanted to throw that you simply big thanks – you settled a few things in my situation! entirely, however this post gives nice understanding yet. Find all the latest free legal Christian songs! Get the bible downloaded onto your iPhone and iPod Touch!